sloga Srbina spasava ). The meaning of sloga (unity, harmony) was key to interpreting the slogan. As Milosevic began to speak of the necessity for battles—"not armed battles yet, though it may come to that"—the unity was being defined as the unity of Serb against Albanian, and by extension, against all others. It was natural for a former communist official, raised in the personality cult surrounding Marshal Tito, to move easily into another kind of personality cult. As the communist party crumbled, Milosevic had adroitly transformed himself into an ethnoreligious nationalist. At the 600th anniversary of Lazar's death the crowd chanted "Kosovo is Serb." Other rallies included slogans such as: "We love you, Slobodan, because you hate the Muslims." During the same period that Milosevic stood at Kosovo in front of the CCCC symbol, that same symbol and other symbols of Serbian religious nationalism such as the Kosovo maiden and the double-headed eagle were reappearing in Serbian communities around the world. Milosevic's abandonment of the goal of Greater Serbia in the negotiations leading up to the Dayton accords of 1995 as well as the attacks of his wife (Mirjana Markovic) upon the clericalist movement within Serb nationalism suggest that Milosevic has no deep ethnoreligious convictions. Yet, to say that Milosevic's aggression was not motivated by personal religious concerns is not to say that the forces he unleashed were not deeply, even fanatically, religious. Many Serb and Croat religious nationalists are not religious in the sense of observing regular religious practice. 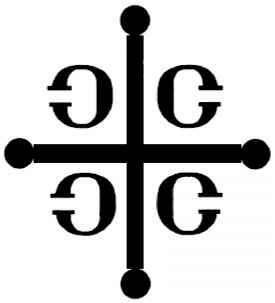 Symbol of Serbian religious nationalism: The CCCC cross. way to the truth, an inability to engage in self-criticism, a violent intolerance of those who disagree, and a zeal to use the full power of the state to enforce beliefs and practices deemed proper. In some cases religious fundamentalism is at odds with nationalism and attempts to abolish national states. In other cases, as with Serb and Croat Christoslavism, the fundamentalism and nationalism reinforce one another and merge. In this popular sense, the clericalist wings of both Croat and Serb nationalism are fundamentalist, while personalities like Milosevic merely exploit fundamentalism for their own political gain. The religious ideology of the violence was complex. It was at once part of a modern surge in religious militancy after the cold war, a reappearance of a Serbian nineteenth-century ideology that constructs an "age-old antagonism" between Muslim and Christian in which the Muslim is a race traitor, and a new manifestation in a history of assaults on non-Christian populations in Europe grounded in manipulation of the Christ-killer charge. property of Serb militancy but as Serbia's distinctive contribution to a shared human understanding. Christian scholars have been addressing the problem of the Christ-killer theme in the New Testament in light of the Holocaust and its implications for Christian anti-Semitism. The use of a Christ-killer motif in the Bosnian context poses a theological challenge not only to the Serb Orthodox tradition. The silence of self-identified Christian leaders in many parts of the world in the face of the Bosnian genocide makes it clear that the issue demands attention by the wider Christian community as well. If many Serbs have either supported or remained silent in the face of religiously motivated genocide, the same can be said for most nations. Certainly no one writing from the United States, founded on territory "cleansed" (with religious sanction) of its native inhabitants and built with the labor of another people seized as slaves from their ancestral homeland, could possibly claim a shred of moral superiority. Nor could anyone watching the Christian Identity movement's instigation of racial and religious warfare find any cause for comfort. To acknowledge the responsibility for genocide within our own traditions is not to abandon the right and the duty to resist new forms of genocide. Indeed, that resistance can be authentic only to the extent that it is rooted in the willingness to confront our own demons. Such resistance is doubly imperative because of the complicity of Western and Christian powers, through the UN Security Council and NATO, in the destruction of Bosnia, a complicity that will be examined in the final chapters of this book. No account of the fate of Bosnia can be complete without an examination of the role of Croatian Christoslavism in supporting the destruction of the Bosnian people. While the religious element in Croatian nationalism has been more subtle than Serbian religious nationalism, it has been no less effective. 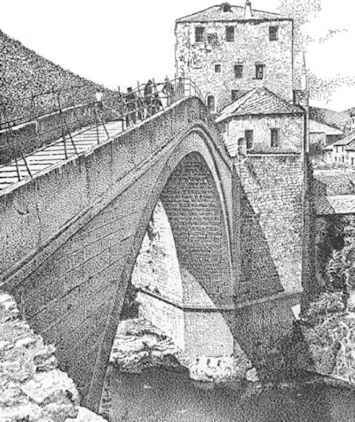 It is symbolized in the 1993 destruction of the Old Bridge at Mostar.